I gave this book to Buddy for his birthday or Christmas or something several years ago and I've been meaning to read it myself ever since. I like all kinds of apocalypses (apocalyspi?) and the idea of a robot apocalypse is no different. This one is told in a similar format to World War Z - in military dispatches, transcripts of recordings, and eye witness accounts. Unlike WWZ, we track the same characters over the course of the entire event, from the creation of Archos (the computer mastermind) to the last days of the war itself. I liked the formatting of the book. I'm drawn to books where authors use formats other than straight narrative - emails, transcripts, interviews, etc. I didn't find any of the characters particularly deep or dynamic, but I don't think that's what the author was going for. 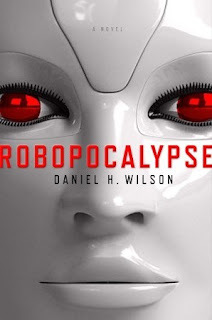 If you're reading a book about the robot apocalypse you probably know you're not going to be getting lots of interior monologue and character development. It took a while for the book to really pull me in, but once it had my attention I was hooked. I liked the way the author had us follow the same cast of characters in various world-wide locations as the attacks progressed and they were forced to fight to survive. Obviously, we're talking lots of action and a fair amount of tech talk. I don't consider myself a techie by any stretch of the imagination, but I was able to follow the story with no problems, although I did find my attention wandering during the more in-depth technological descriptions. No issues, but also no raves. I thought the narrator did a fine job and I appreciated that he kept his voices simple for the most part. I think it will appeal to a certain audience: science fiction readers, dystopia fans, those who enjoy technology in their fiction, maybe some fantasy fans. I don't think it's something that is going to jump out at the average reader, however. I enjoyed it, though, and definitely recommend it to my fellow geeks.